I spoke with a friend a few weeks ago. I won’t name names, but I had the fortune of traveling with her and about 20 other members of my English Department classmates to Oxford, England during one college summer. The subject of our journey across the ocean was Shakespeare, one of the most prolific writers ever. One sunny day (and it was particularly sunny that summer in England, thankfully) we all sat in a graveyard at the University and took turns reading all of Shakespeare’s 154 sonnets. We also saw or read many of his 37 plays. The trip was enlightening and I am certain that it inspired me in part to be an actor and a writer. When I spoke with my friend recently, the subject of book titling came up as I was attempting to figure out the title for my second book, a collection of essays. She presented me with a title idea for her own book, which I won’t write here for fear of it being stolen. It was fantastic and it perfectly fit her personality and writing style. She then stuck a giant spike into the side of her circus tent of an idea, deflating it and sending it crashing to the ground. “Of course, I’ve titled ten thousand books that will never get written.” In response to my friend and to all the other people who think they cannot become authors, I have written this book to help. Help yourself to become a writer today! I’m here to tell you that it is possible to become an author despite most of your time being taken up by working and sleeping. Even if you have a family and you spend your additional free time taking care of your kids, your spouse and your bills, it is possible to become an author. Now, obviously, the less time you have, the longer it will take, but you still have a shot to get that book that’s been bouncing around your head onto the page. Some of you chosen few will respond with the phrase, “You’re full of crap!” Which is perfectly fine; I have developed a thick skin to such silly, non-specific criticism. Those of you who are still on board might ask the productive question of, “What do I need to make this happen?” The three things you need are desire, time and tools. Author Bryan Cohen has been writing on the subject of writer's block and personal development since 2007, though he's been a playwright, poet and fiction writer since 2001. Cohen has a degree in English from the University of North Carolina. He has written 3 books, 2 plays and several screenplays. He is also a tutor who comes from a family of teachers. He currently lives in Chicago, Illinois where he also acts and does improv comedy. 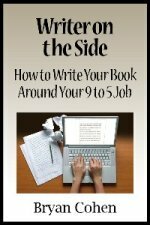 Writer on the Side teaches you how to cultivate desire within yourself, how to gain time throughout your day and how to use tried and true tools to truly become an author, no matter how busy and stressful your job makes you. Even if you feel like you barely have time to breathe, your breathing will not be worth it if you have a book inside just waiting to escape. Pick up this book today and use it to tell your story, any story. If you are a writer, do not let any more time go by in which you don't have a book to your name. If you start today, you could have a book written in several months to a year! Start Your Side Career Today! The book is available today at a low introductory price of just $25 $2.99. The time to become a writer is now. Don't wait, pick up this book right now to start becoming the writer you always dreamed you could be. Writer on the Side is a downloadable eBook (a PDF file). Click the button to purchase it for only $25 $2.99. I want to write a book despite my job! Send me Writer on the Side today!